King Tee might just be the martyr of the g-funk era. 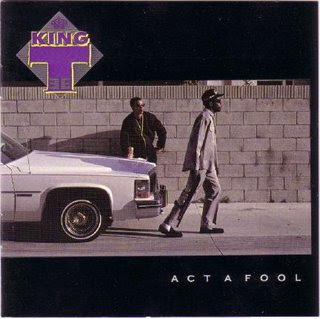 But, as such, his best record, Act a Fool can be reduced to a handful of worthwhile tracks. Still he preceded both Straight Outta' Compton and The Chronic, even if this effort doesn't exactly stand the test of time and shouldn't be searched for besides a few 12". Then again, check the cover, he was the first serious joker from the soon-to-be world renown L.A. suburb of Compton. (cue mid-western white-teens in fitted all-black "Compton" hats). This first photo shows Tee in a confident swagger with his sawed-off though all he's bound to do is kill the bottle of rum - no dead homies upon this backyard. In typical South Central fashion, at least for the time being, Tee is light-hearted (with plenty of comedy skits about mommas and getting too drunk), boasting about his DJ (deejay Pooh, who went onto g-funk fame), and at the precipice of violent revenge only if you can out battle him. His best weapon is his cadence, certainly not the breaks (that said, the duo was the first to sample a generation of recycled samples) -- here Tee shows exactly why he is quoted as wanting to be a East Coast rapper on the West Coast. There's a grunting eloquence and strident head-bop to Act a Fool's lyrical flow, a broken edge that follows the scratched-in corners more than a full-room. In other words, a get-in-your-face braggadocio with an boomerang voice. King Tee was an outsider, maybe too clownin' drunk. The last legitimate time we've heard from him was Chronic 2001. There might just be a comeback on Detox, because Tee has always had the backs of those who came after him, and always been, at the very least, a shout-out away. Dumb and minimal, diluted ganster-rap before it's fermentation, Act a Fool has lingering charm -- even if his best single, "Bass" (let us not forget "Ruff Rhymes" from At Your Own Risk) is here given the remix treatment. King Tee - "Bass (Original Mix)"
Oh I forgot...King Tee also did one of those awesome/controversial St. Ides commercials.